In conclusion: Puma found her forever people (in a one-pet household), endorphins were released and rescue is easier and more rewarding than you think. There is irony in being the de facto cat lady for a dog rescue. It loosens a bit when you consider that Jayma has/does rescue dogs and RezDawg Rescue has saved thousands of cats from an “uncertain fate.” The fact remains: Jayma is an animal person. This matters to Puma. It matters a lot. As an example of living life with a big heart, a passion for animals and the patience of Job, Jayma sets the standard. Puma’s rescue was a long drawn-out process that actually started in 1998 – seven years before she was born. This is when we cut to the scene showing Jayma sneaking into a kennel in the back corner of the Kansas Humane Society in Wichita. Cue the foreboding orchestra music with lots of sad woodwinds because this cage is the rescue version of being banished to the gulag. It’s where the unadoptable, sick or terrified dogs are sent because most people (even animal-loving volunteers) don’t have the patience, instinct or knowledge to heal the shattered souls that have been banished there. Out of sight, out of mind. Pay close attention: Jayma didn’t look at the dog. She closed the kennel door behind her and sat down, doing her best not to look at anything. And she sat. And she waited. And she killed time, maybe balanced her checkbook in her head or concentrated on breathing through her navel. The specifics aren’t pertinent. What matters is the dog in the gulag had time to evaluate Jayma, to realize she wasn’t a threat. A connection was made, a hand got licked. Then a face. A life was saved and while that dog may no longer walk the earth, the excitement Jayma felt when this dog responded fills her heart to this day. 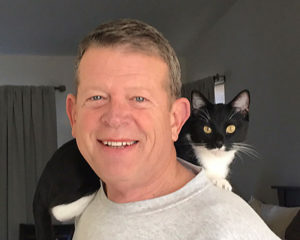 Per Jayma, “The guy looked at me like I invented plutonium or something.” He left with a white cat and Jayma learned that common sense is a crucial cog in the rescue wheel. Jayma eventually moved away from Wichita but she carefully packed her Common Sense and her Animal-Loving Heart. She’d need them later on. Unknown to all, Puma was that much closer being rescued. And Puma moved even closer to rescue because of a senior dog named Oso. Oso was a 16-year-old German Shepard/Husky mix who needed a new home. 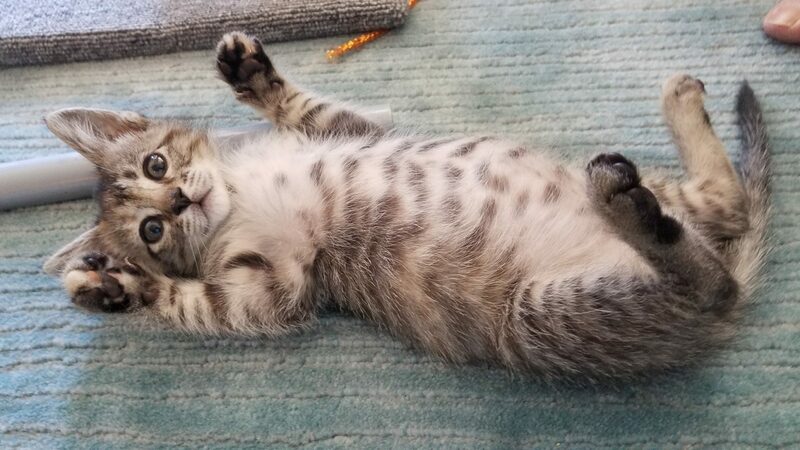 Animal rescuers, volunteers and fosters lead the same busy lives you do. They sometimes have health problems, annoying neighbors or competing priorities that cut into their propensity to volunteer for the local Humane Society. So Jayma skipped the Humane Society and adopted Oso off a Facebook post because Oso got the raw end of the deal. Oso was adopted as a senior dog who lost his home. His last nine months were filled with fantastic fun and unconditional love. Cue the sad woodwind music again because Oso passed a few days later. 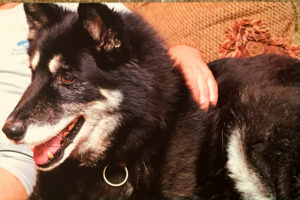 Jayma thinks this part of Puma’s rescue story is about the satisfaction she (and her family) felt from ensuring Oso’s last nine months were happy ones. During the edit, I’m going to change out this scene’s sad music for something inspirational. Not quite as annoying as trombones and trumpets, but something that escalates to a crescendo… a harp may well be involved. I think this part of Puma’s rescue story touches on the fact that Jayma’s daughter was clearly in touch with Oso on a level available only to young children and clairvoyants. This part of the story is about how love, empathy and a connection to animals can be passed to future generations. Good People raise Good People, and in this day and age, we need all of them we can muster… Puma is about to be rescued. Puma finally makes her entrance at the start of Act Three. Puma was a new mama in a bad mood. The scratch marks on Jayma’s arms, echoes of panicked hissing in her ears and the common sense earned in Wichita resulted in Puma being moved to a quiet corner in the spare room to do her mama cat thing. Despite this, Puma’s behavior grew worse and worse. She began to abuse her kittens. One of them didn’t make it. Puma was all but unmanageable. Something needed to be done as The Question approached: Kill, No-kill. All rescuers fear the moment when The Question becomes pertinent, but Puma was miserable and her quality of life was deteriorating quickly. Jayma found another nursing mama who accepted Puma’s kittens. She moved them from one room to another one at a time, slowly and patiently. But Puma was having none of it. Jayma couldn’t get near Puma without protective clothing. They may not have been welder’s gloves, but they should have been because Puma still managed to injure. As The Question rolled around in the part of Jayma’s mind she prefers not to visit, a thought occurred. “This cat is going to die if I don’t do something. I don’t know why she’s doing what she’s doing and I’m out of ideas on how to help…” Of course, this is when inspiration strikes. Jayma donned the gloves (and maybe a helmet and shin-guards as well – I would have,) got a good grip on Puma and gave her an injection of Clavamox. And she did it again the next day. And the day after that. And Puma responded. She looked better, her aggression dissipated and she slowly became the cat that Jayma saw the whole time. Puma’s behavior resulted from an illness we can’t define, but who cares? She responded to treatment. All we know for sure is that Jayma’s refusal to give up on “just another cat” resulted in a successful outcome. Puma was soon ready for her forever people. And the people came. Puma is now the only pet in the household and if you didn’t know her backstory, you’d never know she had such a hard time of it. 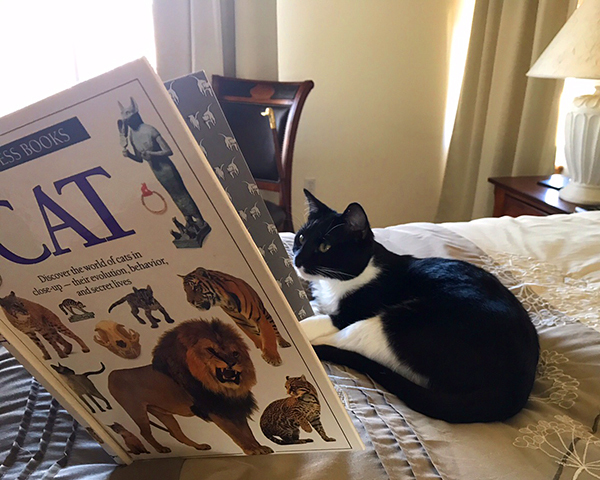 Now that Puma is operating at peak efficiency, she’s considering going back to school… but first a little brushing up on her ancestry. To support more cats in need like Puma, please donate! 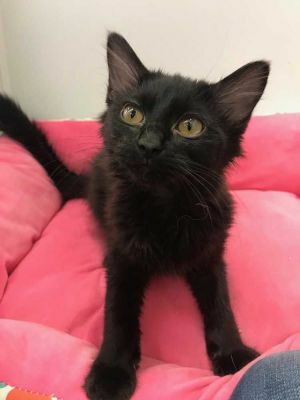 I’ve been working with Jayma at the Petsmart in Lone Tree to help socialize and play with the cats she brings in and never knew how she got started doing the wonderful work she does. She’s truly an inspiration to anyone that has the pleasure of knowing her and loves all her little fur babies. We are so lucky to have people like Jayma in this world who never give up despite incredible odds. Thank you for writing such a wonderful piece on such an amazing woman! Well written. I like the “back to the future” style. Also a good reminder that an animal may have health issues if it’s behavior changes. Awesome story telling. Thank you for sharing Puma’s story and thank you Jayma for all your efforts! Love the blog. Please keep it going! Great story. And thank you for not giving up. Sometimes rescue is a bit more challenging (as if all rescue isn’t challenging enough) yet the ones that really make you work for it are THE most rewarding. Don’t we all want to be ‘not given up on’. Thank you!